The color of the flowers vary from shades of pink to yellowish. There are only a few locations recorded in Namibia where the flowers have a crimson color. Some other Hoodia also produce reddish flowers e.g. Hoodia macrantha as well as a couple of hybrids. Some nurseries claiming to grow Hoodia gordonii have plants that consistently produce red/crimson flowers. It would be interesting to know the origin of these plants. 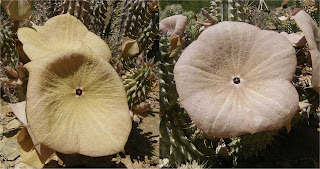 Two photographs showing the most common color variation in Hoodia gordonii flowers. 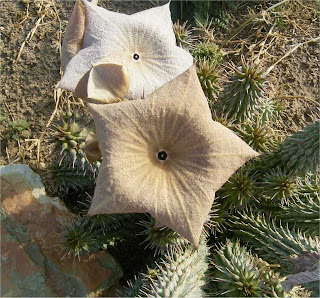 There is great variation in the size of the flowers within the same locality and some flowers are almost round while others still have a semi five lobed appearance. Hoodia gordonii have no specific flowering time. Individual plants flower at different times of the year. Most plants flower in spring and autumn. Some flower in midsummer and occasionally there are plants that flower in winter. The flowers are pollinated by flies. The flowers have an evil smell, resembling rotting meat, that attract the flies. 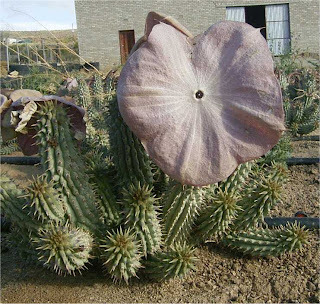 Here are some more pictures illustrating the variation in the flowers of Hoodia gordonii. The pictures were taken at Leopoort, south of Oudtshoorn, where we have some juvenile seed grown plants. The flowers are essentially five lobed but often the lobes are joined together making the flowers appear anything between five lobed and round. A circular flower. There is a tendency for the perimeter of the flower lobes to bend backwards. This makes some flowers appear more round then what they really are. This particular flower was however almost completely round. A rounded five lobed flower. 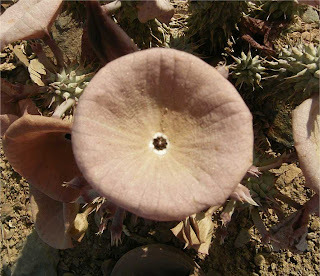 The average diameter of cultivated Hoodia gordonii flowers is probably some 70 mm to 80 mm. 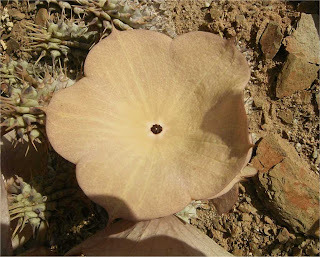 In our Hoodia patch at Leopoort the largest flower I found was 120 mm, and the smallest flower 40 mm in diameter. 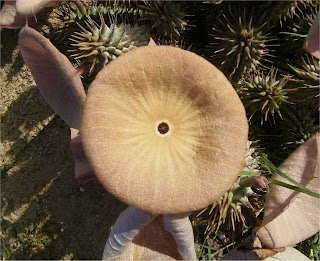 The largest Hoodia gordonii flower at Leopoort, measuring 120 mm across ! The smallest flower with a diameter of only 45 mm.